Went for a beautiful walk yesterday. The sun was shining and the birds were singing. There was a sufficient breeze for it not to be too hot which it would have been without one. Walked to the coast and the view was breathtaking. 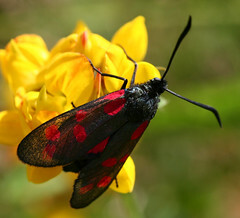 Spotted lots of butterflies and moths, among them the Common Blue and a 6-Spot Burnet. On the way home I spied a fox with a rabbit in its mouth heading across the field. It was all a beautiful experience.